Hillary’s most consistent supporters have been folks over 50, especially women over 50. With her statement about RFK’s assassination, and her bizarre “apologetic” explanation (namely, I was thinking about Teddy and so I mentioned Bobby’s assassination), she has lost a substantial number of these supporters. I will not say all. I will not say those closest to her. But I will say, a very significant number. Most importantly, in terms of the race, many superdelegates in this age cohort, who may have been leaning her way, will be looking around for the nearest Exit sign. Ditto for those who were in favor of placing her in the VP slot. Most of you reading this commentary will have heard what Hillary Clinton said yesterday afternoon, May 23rd, to the editorial board of South Dakota’s Sioux Falls Argus-Leader, in response to a question about staying in the race. And you may have heard Clinton’s “apology,” also reported by Seelye in the Times. Members of the Democratic Party who experienced the trauma of the assassinations of John Kennedy, Robert Kennedy, and Martin Luther King will understand that Clinton crossed a line yesterday. Many will agree with Representative James E. Clyburn of South Carolina, an uncommitted superdelegate. Seelye reports that Clyburn “said through a spokeswoman that the comments were ‘beyond the pale.’ ” For those who remember Bobby lying in a pool of blood the night that he won the June California primary, little explanation is needed as to why prominent figures shouldn’t mention the assassinations of presidential candidates. To say that Hillary was simply using RFK’s assassination as a time marker doesn’t cut it. There are simply too many other ways that Hillary could have talked about extended nominating contests. For example, she could have simply said, RFK won the California primary in June. “Oh, but Hillary would never wish the death of another candidate,” a supporter might reply. But it is not a question of her wishes, whether benighted or angelic. I leave it to the psychologists to analyze her motives. What I do know is that someone who lived through the sixties as an adolescent or adult should understand the dangers of invoking the assassination of a presidential candidate during a campaign, especially one in which the front-runner is an African-American. And Clinton not only invoked an assassination, she invoked the assassination of the brother of a Senator who has just been diagnosed with terminal cancer. How disturbing is this? Just ask yourself, could you have imagined this story before it happened? Please don’t tell me that her words can be explained away entirely by ‘Hillary fatigue.’ First, because she was quite lucid when she was speaking, and, second, because she has raised the issue of assassination before, without using the term. Perhaps most tellingly, her “apology” showed little understanding of the seriousness of her “gaffe.” Yes, she should have apologized to the Kennedys, but she should also have taken responsibility for her remarks and made a sincere apology to the American people. She is going to lose support among influential boomers, support that she can’t afford to lose at this point. This is the end of Hillary’s quest. Her judgment can no longer be trusted. Democrats will not take a chance on running her for president or VP. It is just awful that it had to end like this. I don’t care who you are, you just don’t go there. Ever. And you’re right about Bill in ’92. Up until now, I have reluctantly accepted that, in the interest of party unity, this primary season was be seen to its completion, much as I’ve felt that the Clinton campaign hijacked the primary process, keeping the superdelegates hands tied on endorsing Obama. As of yesterday afternoon, however, when Clinton made her RFK assassination comment, it is a different morning for the Democratic Party. Yet, I cannot believe, as I live and breathe, there are those out there who not only excuse her comment as “an unfortunate reference,” or a “historical reference,” or “a misstatement” due to campaign fatigue, but who condone her comment, many cheering her on in the most racially vitriolic terms imaginable. I implore you, and I know that I speak for many, many Americans — from common citizens to politicians and superdelegates — to push for an end to this. The time is now. Not June 3rd. Now. I agree with Laura from South Carolina. It is a sad day indeed when Hillairy feels she has to invoke Bobby Kennedy’s tragic death as a reason for her to stay in the race. It is obvious what her dark and inner thoughts are in regard to Senator Obama. She knew and knows EXACTLY WHAT she was saying and WHY. Her poor excuse of an apology puts the blame on her critics and not on herself. “I regret IF anyone was offended” That is NOT an apology, she takes NO responsibility for what she said; she places full responsibility squarely on her critics for daring to find her statement offensive. Shame on Hilliary Clinton for making the comment in the first place and shame on Hilliary for NOT taking responsibility for what she said. Notice that Hilliary has NEVER apologized sincerely; it is ALWAYS, “I regret IF anyone WAS offended” It is clear Hilliary cannot find it within herself to say “I am sorry”, she feels that is BENEATH HER! (Continued) I failed to mention her other other “favorite” reason for her lying, fraudulant claims to “glory” (Bosnia), and distortion of facts: “I misspoke”, and a recent one, “I misheard”. I believe the majority of us are sick and tired of Hilliary and Bill. Very inciteful & thoughtful article, Mitchell!!! I believe what you say rings a GONG of truth from recent political events that some indiviuals, sadly, will never comprehend, yet MORE do & will! I ALWAYS defended the Clinton’s since their early White House days up to last fall – when the Democratic Presidential posturing really began to take off. My husband & I were watching a little bit of a debate – Obama had just fininshed with his response & Clinton was just beginning hers – when she opened her mouth about the Iraq War, I think it was, and said something really assinine. I thought to myself that this woman isn’t very informed, or she wouldn’t have said something so ignorantly flippant. I immediately said that I didn’t trust her & that she didn’t TRULY have American Citizen’s best interest in mind. Since then, almost EVERY single thing that has come out of her mouth has insulted ME, and millions like me!!! MY demographic characteristics are: age 45+, female, white, from a “small town” in Ohio, unemployed, very poor health coverage with pretty big health issues, a home owner who just refinanced the mortgage 2 years ago, blue-collar, lower-middle-class income, with some higher education. Thus, for the most part, I could EASILY fit into her “mold” for support. But, I HAVEN’T & I won’t. I had a sick feeling in my gut EVERY TIME she would say “I will stop at NOTHING” to win the race; that her & McCain were experinced & Obama only had “a speech he gave in 2002”; when she & the media clobbered Obama & the Amercican public over the head, 24/7, for 2 solid weeks with Rev. Wright; her & her supporters CONSTANTLY saying, “you never know WHAT could happen between now & June! ?” Man, she made me sick AND too distrusting of her, Bill-Bubba-Boy, & her supporters. Then she made her BIGGEST verbal faux pas of her untrustworthy life!!! She has been excused of EVERY ONE of her flimsy accusations, her bosnian “misspeak”, her forgiving John McCain for saying that Chelsea was “so ugly…because her FATHER is Janet Reno”, her complimenting FoxNews, John McCain, KARL ROVE; her incessant insults & falsely contrived personal opinions of Barack Obama’s loyalties, qualifications, & “experience”; “working class, HARD working class whites”; but, this last one went too far for me AND the general public to forgive!!! I must say, not surprised though, that the MSM is mostly behaving pretty tolerant of this latest “verbal assassination” (PLEASE, parden the pun) – ESPECIALLY CNN, whom I affectionately refer to as the Clinton News Network)! They posted an article today professing Clinton “apologizing” for her comments! You’re right!! NO, she did NOT “apologize”! And will be “forgiven”, yet again by the media & her supporters, for invoking what will become another riotous outrage by American’s over her unstoppable, never-ending insults on her colleagues and the American people, their needs, wants & desires!!! You are correct that we need to start demanding action from our leaders to end her literal insanity before she completely destroys our Democratic Party, it’s processes, & our faith in it to overcome & progress successfully! Thank you for letting me vent my feelings & opinions here: MOST of us women at or nearing menpause ARE NOT ALL MENTAL!!! And, I really wanted to let you know how much I truly appreciate your blog-inputs!!! As a 55 year old woman, I was very hurt. I was young with Bobby Kennedy was assassinate, I remember everything to this day. I cried like a baby. 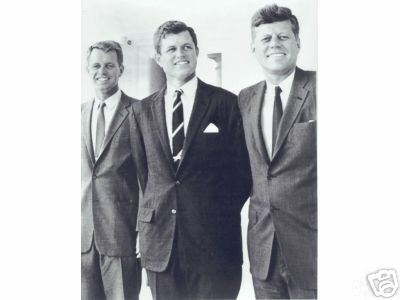 I LOVE THE Kennedys. I can forgive Hillary for a lot of thing but I cannot let this one go. I want to thank you for your comments, I agree Hillary and her nasty comments made me sick. When she first announced that she was gonna run, I was proud as a woman, however I’ve always supported Obama. He’s from my state and if she had won fair & square I would have voted for her. However after her stupid comment on friday, I’m done wuth her and I have NO RESPECT for her at all. And she should have also apologized to Obama and his family. This latest is really beyond the pale. I was 17 when Bobby Kennedy was assassinated…this Boomer is through with Hillary. I was a youth when RFK was assassinated, and it was very painful then, not to mention a senator (Hillary) would bring it up in such a manner as she has. It is truly disturbing, painful and downrightly disrespectful. Apparently, Hillary feels that if no one in the election stops her from her wild crazed misfit of campaigning, that’s it’s okay. She needs to just get out, she has left a disgraceful and embarassing legacy for the entire Clinton’ s family, just as Bill did with the Lewinsky ordeal. Their second chance after destroying their first chance is even worst. Get them out and keep them out. I would hate to have to try and explain to my grand daughter why it is so hard for women to make office. Hillary is no doubt giving the world second thoughts to elect any woman, for the record (we are better woman than that, she is a rare misfit of a case). OBAMA 08!